Day #4 and the letter D, on the Blogging from A to Z Challenge. And my topic? Holy bajolly, Batman! I originally wrote this post to discuss deadlines, so we'll of course start with that first. But keep reading below, as I've just come across something pretty darn cool, and it's all about donating books to teens - so it fits perfectly with today's letter! Eh-em. Now on to our originally scheduled post: Deadlines. Every writer knows, there comes a point when you need to stop kanoodling that manuscript. It's time to reign it all in. The moment has come when you need to focus on the next steps. But let's back up a moment. While we all know we can re-write our stories and second guess the paths our characters take, a million times - why not help yourself in the long run, by setting deadlines up front? Before you sit down to write that next chapter - have you thought about your long term goals on where you even want to take this story? Do you have any idea what you'll do, once you've written that last line? Setting yourself up for success in the beginning, not only makes the journey getting there all the better - but it also gives you something to look forward to. But start out small. Make tiny goals for yourself and set realistic deadlines. Then tie rewards to each one. For instance: Tell yourself you're going to take one week to finish that initial draft of your outline - then on the 7th day, you're going to the book store to buy a new book. Or a new Moleskin journal. Or, ohhh, a fancy new pen. But it all starts with setting deadlines for yourself. Because if you're anything like me, you can talk yourself into or out of, anything. And if I don't have a deadline to compete against, then unfortunately, anything bright and shiny that floats by, will have my attention (just call me Dora, from Finding Nemo). I'm a pretty competitive person by nature - so I've found that setting deadlines and striving to achieve them, really speaks to my alter-Dora ego. And well, a writer can never have too many Moleskin journals, right? Deadlines - do you set them for yourself? What do you use for rewards? Now on to the something cool part! I was just over at Jessica Love's website - a wonderful writerly friend of mine - and saw that she's participating in something called Rock the Drop...and what exactly is that you might ask? (Don't be ashamed, I had to ask, too!). 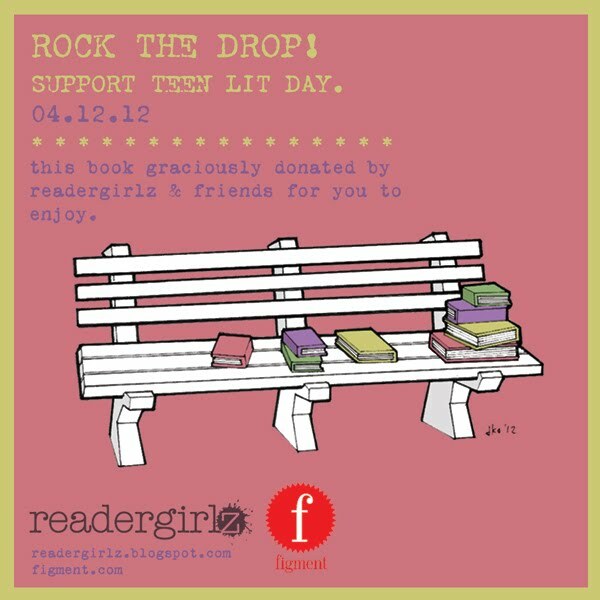 Well, the amazing peeps over at Readergirlz and Figment are hosting the Rock the Drop book event, to support Teen Lit Day on 4/12/12. All you need to do, is print a copy of the bookplate over there to the right and insert it into a new or gently used book (or 10!). On April 12th, drop the book(s) (with the bookplate inside) in a public spot - park bench, bus seat, restaurant counter - you get the idea! Snap a picture of your dropped book to share on the Readergirlz facebook page - then tweet the drop at #rockthedrop with all the other lovers of YA books. And voila! Lucky finders will see that the new book they've found, is part of ROCK THE DROP! What a great way to share a YA book with others and help support Teen Lit Day! A big thanks to Jessica for sharing this wonderful cause - I'll definitely be supporting it, won't you join me?